With my focus on higher yield investments, I often receive questions about various closed-end funds. CEFs are actively managed investment pools with shares that trade on the stock exchanges. A lot of these funds carry very attractive yields. The danger is that this is an asset class where it is hard to separate the good from the bad from the truly ugly. Here are some danger signs and CEFs that illustrate those dangers. There are over 500 CEFs trading on the U.S. stock exchanges. A large portion of the funds own municipal bonds and pay dividends that are the pass-through vehicles for the tax-free interest paid by munis. These funds require different investment criteria and are a topic for another day. Today the focus is on CEFs in the taxable side of the investment universe. The group includes stock funds, bond funds, and hybrid funds. Evaluating individual closed-end funds can be frustrating. Many fund managers are not very forthcoming about what the own in the portfolios and how they implement investment strategies. Here are some clues with examples that show potential closed-end fund problems. 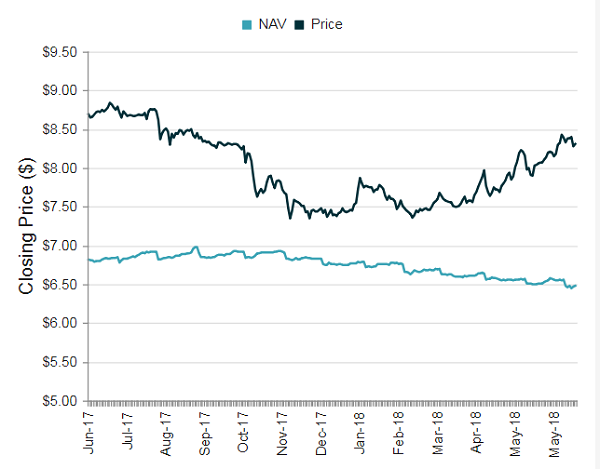 Share price to NAV premiums. A defining feature of closed-end funds is that once a fund is launched, the management company will not buy back shares. Shares only trade on the stock exchange. That means a CEF will have two share prices, the market price and the net asset value –NAV. Both deep discounts and high premiums to NAV are danger signals. If you pay a premium for NAV shares, you are paying more than the portfolio assets are worth. Premiums can collapse leading to losses in your fund investments. 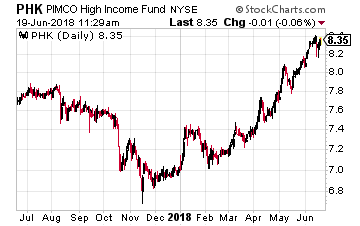 The PIMCO High Income Fund (NYSE: PHK) currently trades at a 28.2% premium to NAV. This means you pay almost $1,300 for $1,000 worth of bond assets. The chart shows how the share price has risen in 2018 even has the NAV has declined. From the price to NAV premium alone, this is a CEF to sell, not buy. If it was on an investor’s buy list, the best course is to wait until the spread again reaches a low comparable to where it was at the end of 2017. This closed-end fund is not worth the 11.6% yield. CEF dividends are not always dividends. Closed-end funds can establish what are called managed distribution schemes. This lets a fund pay level dividends, even if the portfolio income is uneven. What are paid as dividends may be portfolio income, realized capital gains or even return of investor capital –ROC. While some ROC is not destructive to the portfolio value, it is a danger signal and may indicate the fund manager is selling assets to keep paying the dividend. That will erode the NAV over time. 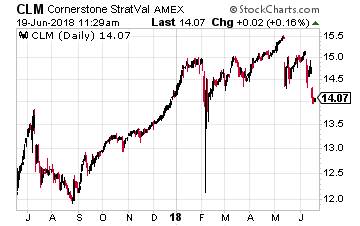 Cornerstone Strategic Value Fund (NYSE: CLM) is a global equities fund with a 20% yield. CLM is paying a $0.2365 per share monthly dividend. Unfortunately, well over half of the dividend history for the last two years has been ROC. So far in 2018, out of each monthly dividend, $0.2015 has been classified as ROC. That’s 85% of each dividend coming back as a return of the investors own money. This fund is an example of a CEF with an eye-popping yield that in reality provides a false sense of investment gains. CLM is a fund to sell, not own. Rising interest rates will be bad for bond funds. In the world of taxable CEFs, there are similar numbers of stock funds and bond funds. For bond funds, an increase in interest rates will lead to falling bond prices. The longer the maturity of bonds owned, the steeper the price decline. Preferred shares are bond-like investments that typically do not have maturity dates. In a rising rate environment, preferred stocks share will decline even more than bond prices. 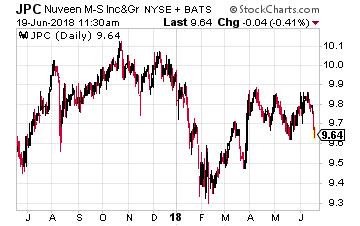 Nuveen Preferred Income Opportunities Fund (NYSE: JPC) is a closed-end fund that owns a portfolio of debt securities and preferred stock. 79% of the portfolio has time to maturities more than 20 years. This is not the portfolio to own if long term rates start to increase. In additional to the long maturities, the PRF portfolio is 34% leveraged. In a rising rate environment, the cost of leverage will go up, and that leverage will multiply the bond value drop. This is a fund to sell if you think interest rates will go up in the next few years and is not worth the 7.5% yield.